Posted by Shikha Chaganti on Friday, February 1, 2013 in Abdomen Imaging, Computed Tomography, Image Segmentation. The treatment of ventral hernias (VH) has been a challenging problem for medical care. Repair of these hernias is fraught with failure; recurrence rates ranging from 24–43% have been reported, even with the use of biocompatible mesh. Currently, computed tomography (CT) is used to guide intervention through expert, but qualitative, clinical judgments; notably, quantitative metrics based on image-processing are not used. We propose that image segmentation methods to capture the three-dimensional structure of the abdominal wall and its abnormalities will provide a foundation on which to measure geometric properties of hernias and surrounding tissues and, therefore, to optimize intervention. To date, automated segmentation algorithms have not been presented to quantify the abdominal wall and potential hernias. 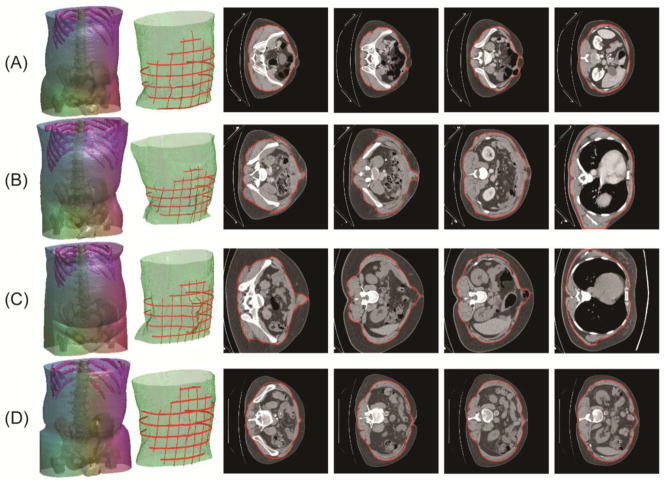 In this pilot study with four clinically acquired CT scans on post-operative patients, we demonstrate a novel approach to geometric classification of the abdominal wall and essential abdominal features (including bony landmarks and skin surfaces). Our approach uses a hierarchical design in which the abdominal wall is isolated in the context of the skin and bony structures using level set methods. All segmentation results were quantitatively validated with surface errors based on manually labeled ground truth. Mean surface errors for the outer surface of the abdominal wall was less than 2mm. This approach establishes a baseline for characterizing the abdominal wall for improving VH care. Segmentation results for four subjects. The first column represents the results of bone skeleton and skin. The second column demonstrates the segmentation of outer abdominal wall (green) overlaid with grids of labeled ground truth (red). The third to the sixth columns show the intra- and inter- variability of abdominal wall over slices and the segmentation results of our approach (red).